Enhancing the perspectives of local Bhutanese worldview and holistic live style. Enabling the participants from both sides to learn from a different culture and experiencing different cultures. Transferring knowledge from Western senior professionals to young Bhutanese professionals. Transferring knowledge from Bhutanese leaders, professionals and teachers on sustainability and holistic lifestyle. Founder of the Dutch Learning Exchange Foundation Dr. Rieki Crins, founder of the Dutch Learning Exchange Foundation and co-founder of BIHT- is a cultural anthropologist and specialist of the Himalayan Kingdom of Bhutan. 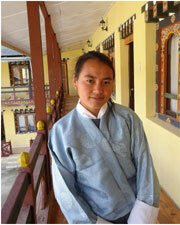 She obtained her PhD on Gender and Sustainability in Bhutan in 2008. Author of several articles and two books on Bhutan. Rieki has been working over the last 18 years in the travel-industry. She designs and guides high end cultural trips to Bhutan, Eastern Himalaya (Sikkim), Rajasthan and in the 90’s in Zimbabwe and Botswana. This experience has led her to create Bhutique Hotel Group BV, to combine her passion for true sustainability in the tourist sector, preservation of cultural heritage, eco friendly building practice, and creating jobs. Rieki founded the Learning Exchange Foundation in Amsterdam The Netherlands in 2009 with the aim of the foundation is to support the creation of the Bongde Institute of Hospitality and Tourism in Paro Bhutan. Mr. Piero Grandi is founder of the Swiss Bhutan Learning Exchange Foundation and co-founder of BIHT is a seasoned Executive and Entrepreneur and business angel with over 35 years of experience in International Banking, Corporate Turnarounds, Start-ups and Business Development of financial, industrial and service companies. A committed support of sustainable development, Piero assists companies and individuals in selecting and implementing their Impact Investments project. As an investor he personally participates to projects related to Bio char, in Europe, Africa and Asia. Piero is the co-founder of the Bhutique hotel group BV and has created the BLEF Bhutan Learning Exchange Foundation in Switzerland to support the creation of the Bongde Institute of Hospitality and Tourism in Paro Bhutan. Tshewang Norbu is the Founder and Chairman of Bongde Institute of Hotel and Tourism. He is a retired banker of Bhutan Development Bank and the proprietor of Bongde Goma Resort, the real-life training platform of BIHT that he was managing since 2008. He is a Bhutanese national and lives with his family in Bonge Paro.